CutLog optimization software. Assists sawyers in obtaining the optimum sawing solution for logs with control over various cutting parameters such as the thickness of center cants and side lumber. In addition it counts price of produced timber. Optimization can be done base on yield or price of produced timber. It allows you plan resources, prepare business offers, plan/analyze production etc.etc.etc. ...... 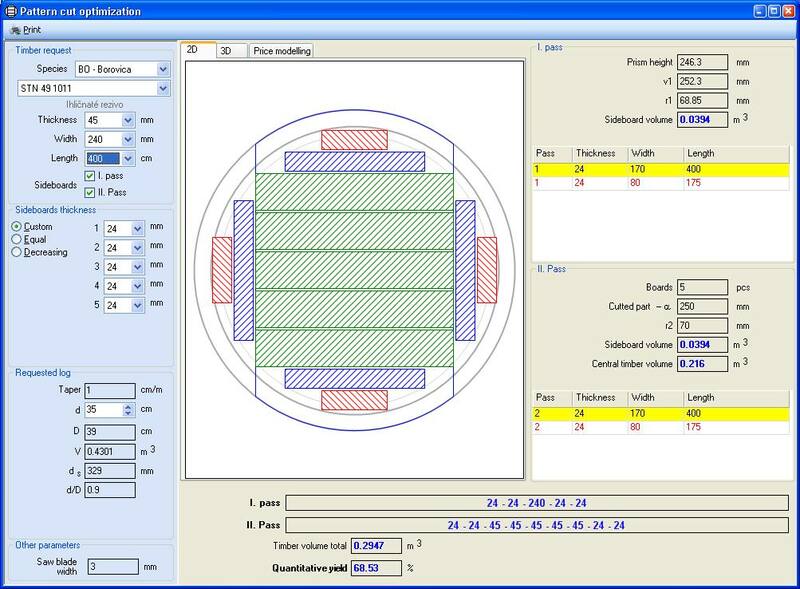 This option allows the user to evaluate the affect of changing value of side boards and value of center cants or lumber. Optimization can be done base on yield or price of produced timber. CutLog has the fastest optimization algorithm (based on Feldman-Sapiro theory). It is able to count over 20.000 full optimizations per second on Pentium4 2,8MHz processor (depends on complexity of scheme). Qweas is providing links to CutLog 3.20.16352 as a courtesy, and makes no representations regarding CutLog or any other applications or any information related thereto. Any questions, complaints or claims regarding this application CutLog 3.20.16352 must be directed to the appropriate software vendor. You may click the publisher link of CutLog on the top of this page to get more details about the vendor.